Today we've pulled just the orange and gray fabrics from our Freeform 2 fabrics. This cool prints look like batiks, but they're not. 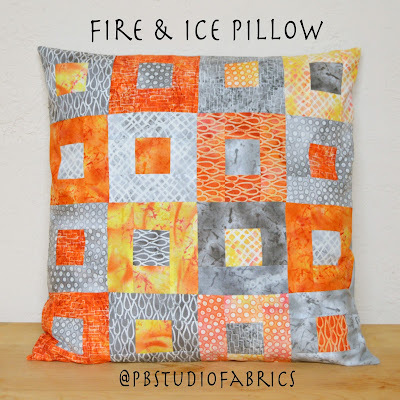 They are, however, perfect for the simple yet graphic Fire & Ice Pillow, and we're sharing the tutorial below. We used the six orange prints and six gray prints from the collection to make the pillow. 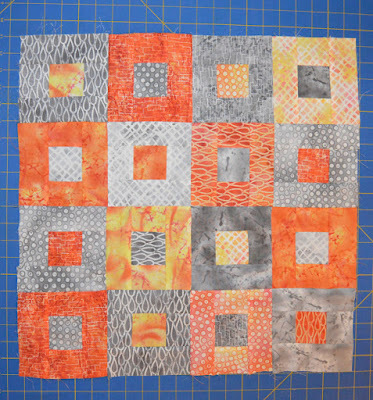 We paired the fabrics and then made a block with the gray in the center and the orange on the outside, and an opposite block with the orange in the center and the gray on the outside. The pillow requires 20 blocks, so you'll need to make two blocks using a few of the fabrics. 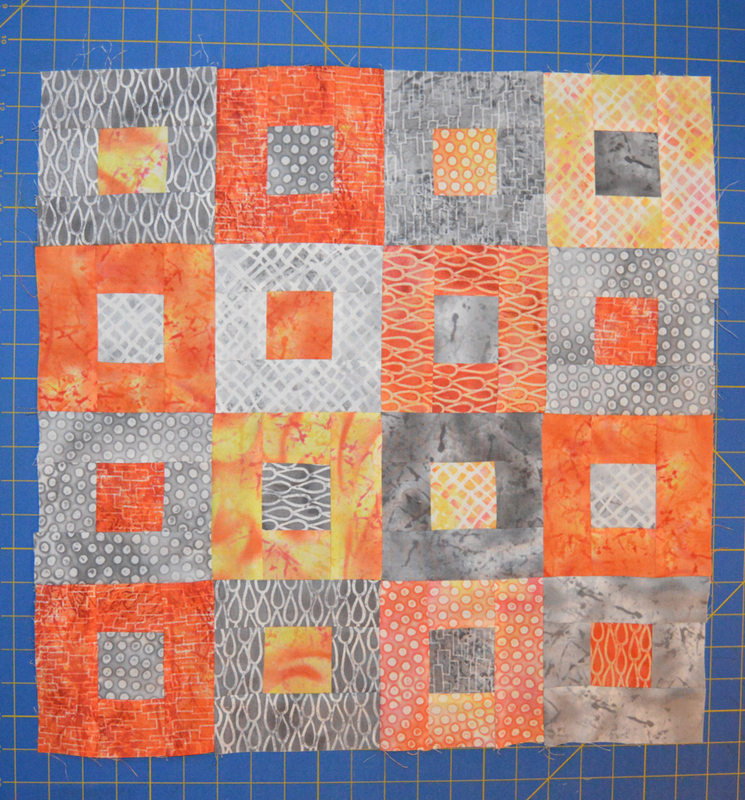 Pair each orange print with a gray print; you'll use these combinations to make a block and a block in reverse. 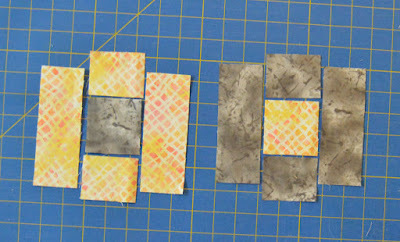 Step 1: Lay out (1) 2-1/2" gray square, (2) 2" x 2-1/2" orange pieces, and (2) 2" x 5-1/2" orange pieces as shown to make a block. 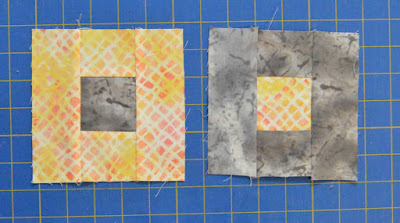 In the same way, lay out (1) 2-1/2" orange square, (2) 2" x 2-1/2" gray pieces, and (2) 2" x 5-1/2" gray pieces to make a block. Step 2: Sew the 2" x 2-1/2" pieces to opposite sides of the 2-1/2" square. 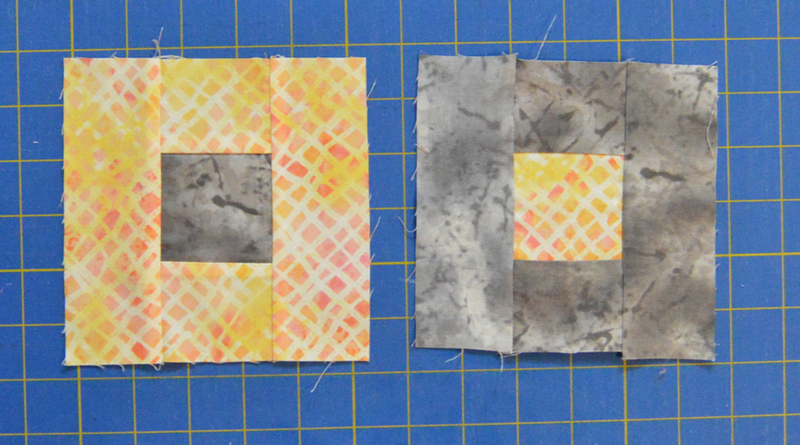 Sew the 2" x 5-1/2" pieces to the remaining sides to make a 5-1/2" square block. 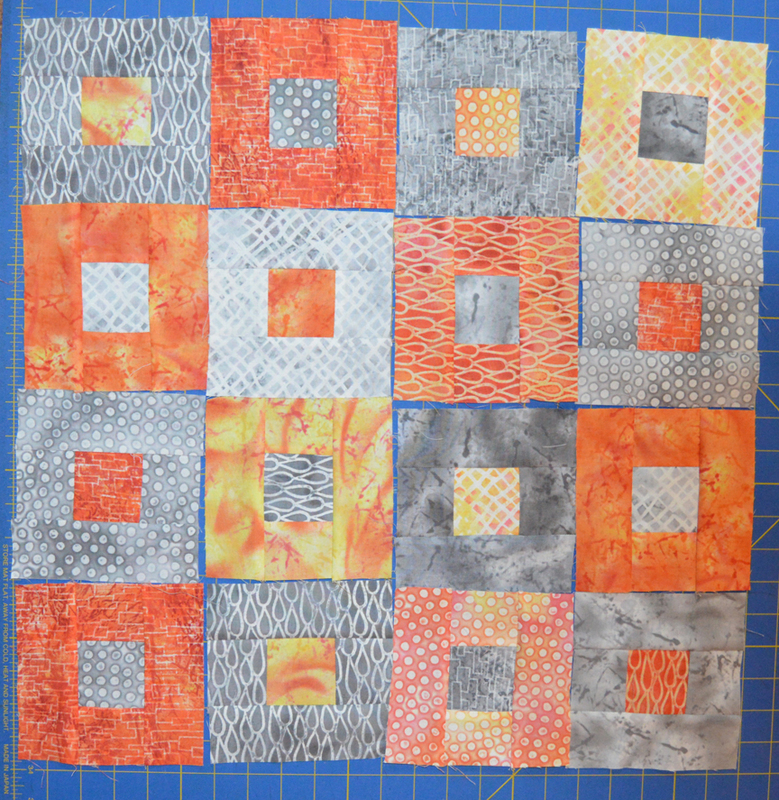 Step 3: Make a total of (20) 5-1/2" square blocks: 10 with orange centers and 10 with gray centers. Step 4: Lay out the blocks into (4) rows of (4) blocks each, alternating colors. Rotate the orange blocks 90 degrees so the seam allowances of the blocks don't overlap and create bulk as you join the blocks. Step 5: Sew the blocks into rows and join the rows to complete the pillow top. 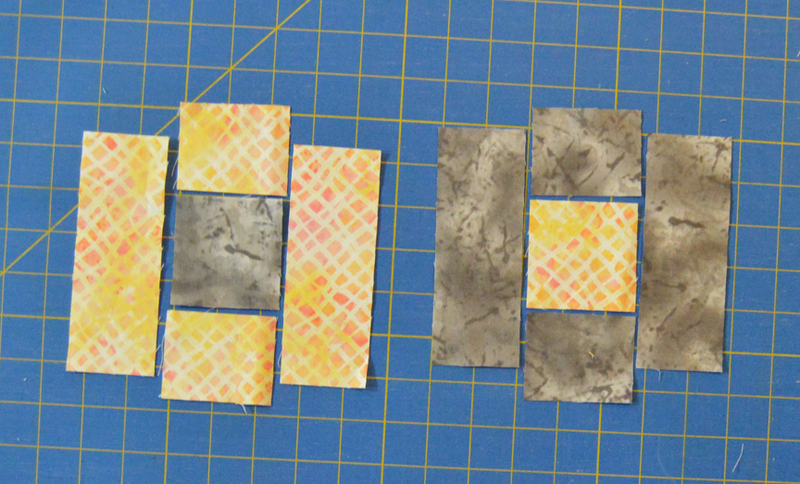 Step 6: Fold the long edge of each 16-1/2" x 20-1/2" background piece over 1/2" and then 1/2" again. Stitch along the length to secure, creating a hemmed edge. Make 2. 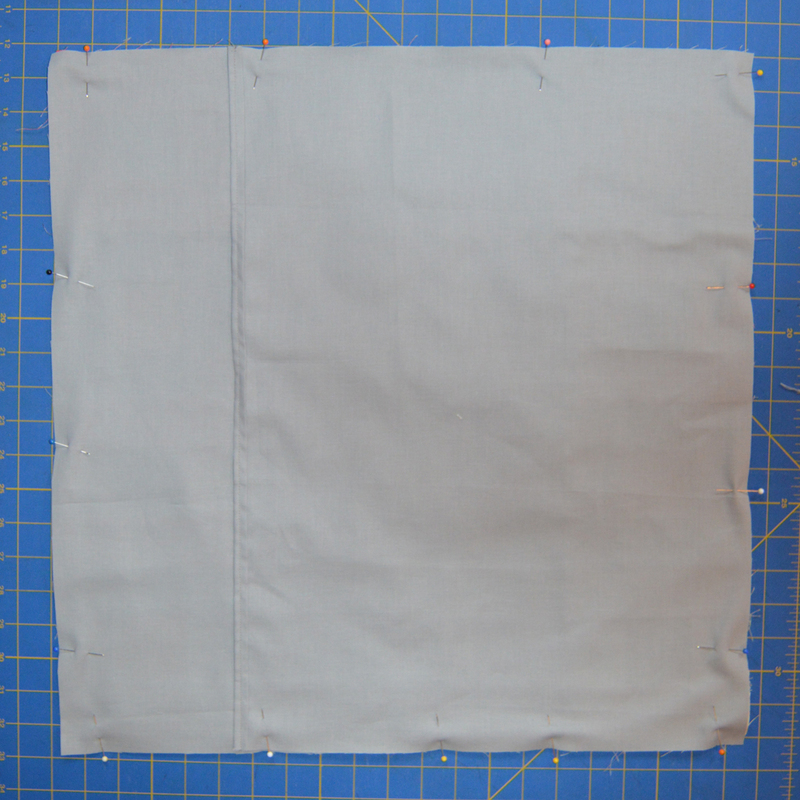 Step 7: Lay the pillow top right side up and position the two hemmed pieces on top, right sides facing the top. Match raw edges, overlapping the hemmed edges in the center. Stitch around the entire pillow. Step 8: Turn pillow right side out and stuff with the pillow form. 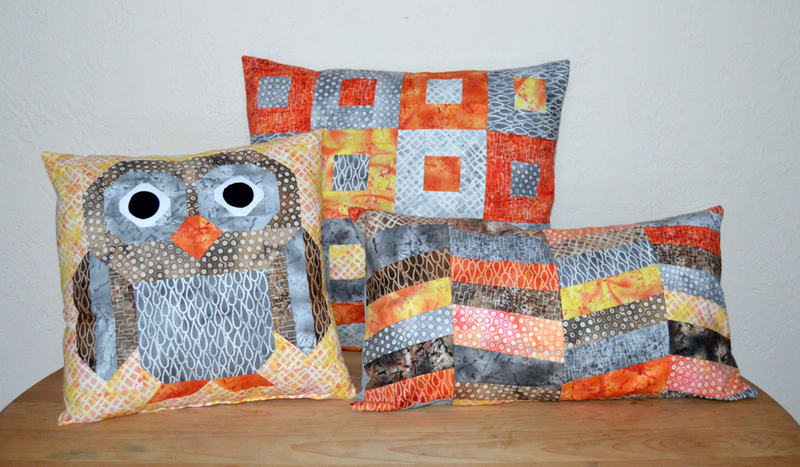 Make all 3 of our Freeform 2 pillows! Find the owl pillow here. Find the Fire & Ice pillow here. Find the All Angles pillow here. 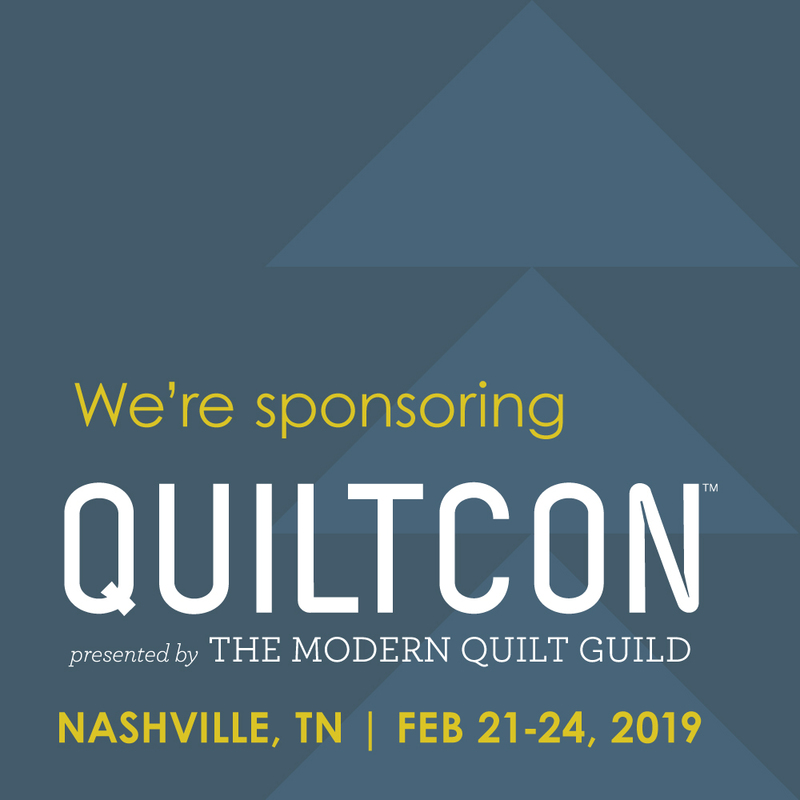 See the entire Freeform 2 collection here and ask for it at your local quilt shop. I really love the variety of greys and oranges. 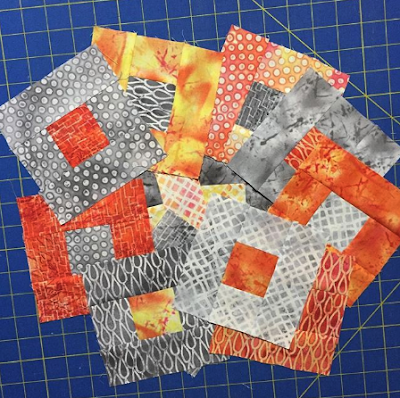 A great project to test out a pattern. Great look and such a fun, modern design. This is one I want to make! Thanks for the pattern! Superb fabric combination with a great pattern! I look forward to making this pillow for a great friend of mine! Thank you so mush for sharing!